A simple and delicious appetizer. Serve alongside pita chips or crackers and some nice wine, and you are all set to deliciously entertain. 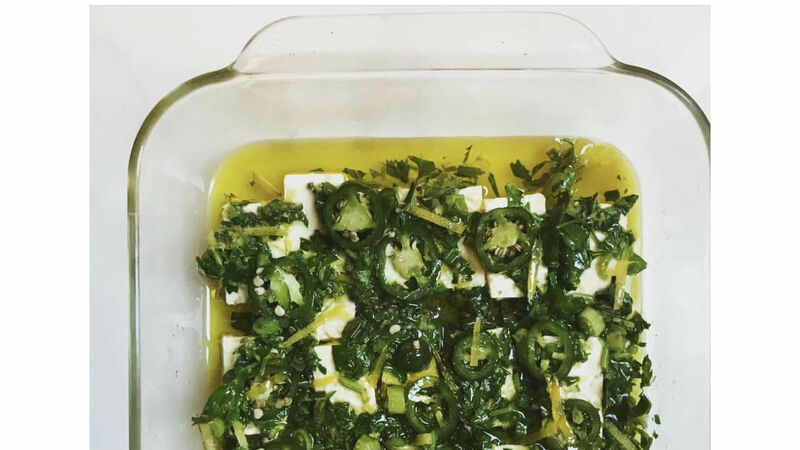 Cut the feta into small cubes and place in a shallow rectangular Pyrex dish. Marinate for 30 minutes or up to one week in the refrigerator. To serve: Remove from refrigerator and let sit on the counter for 20 minutes before serving. Garnish with sumac. Quiche is just one of those perfect combinations of flavors and textures: buttery crust, creamy, cheesy filling and some veggies for good measure. Jewish food writer Leah Koenig shares her secrets for delicious, stress-free entertaining.